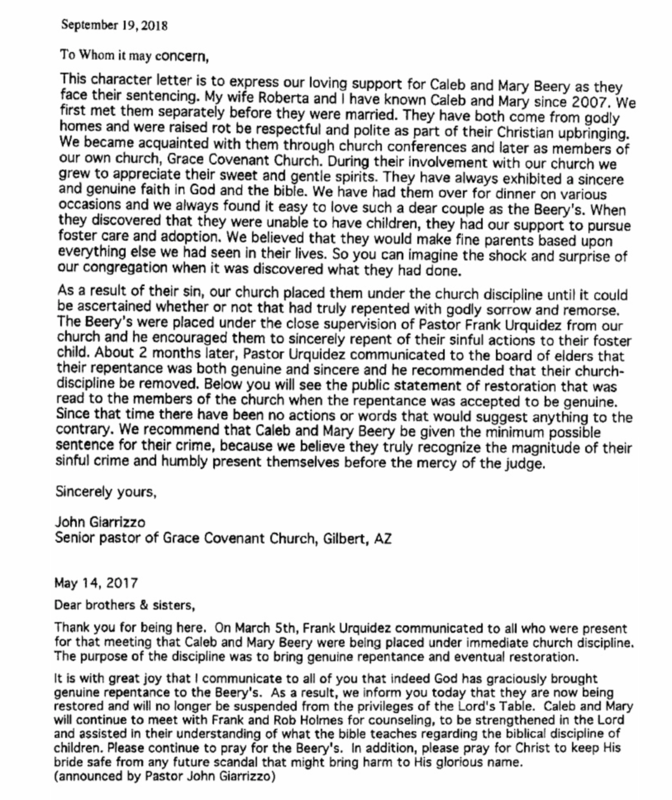 On October 19, 2018, I wrote an article in which I took my former pastors of Sovereign Grace Church of Gilbert to task for writing positive letters of support for convicted child abusers, Caleb, and Mary Beery. Pastors Trey and Rich Richardson only knew the Beerys for a few weeks but had no qualms endorsing the felons for work release while serving their six-month jail sentence. You can read the article here. Below are the Richardson’s letters of support. I commend Trey and Rich Richardson for writing this second letter, it is never easy admitting a mistake and taking action to correct it. I thought of phoning Trey and personally offering him a heartfelt thanks for doing the right thing but he has yet to answer or return a call from me, so decided not to waste my time. That said, I know Trey and Rich will read this article so thanks to both of you. Perhaps now you can reflect further upon your support of C.J. Mahaney? 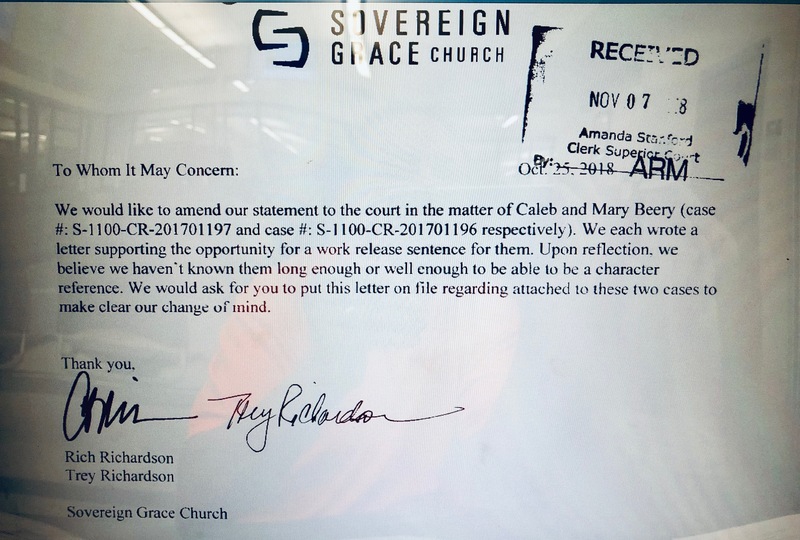 Below I am going to post letters submitted to the court by several other individuals who have written positive character reference letters on behalf of convicted child abusers Mary and Caleb Beery. Prior to that, I will post some information taken from court documents which these individuals may not be aware of. Maybe when they read the information they will also have a change of mind and write to the court asking that their letters commending the Beerys be retracted. 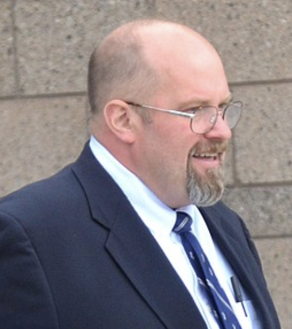 First I should mention that the Beerys have only admitted to spanking the young infant foster girl in their care excessively hard with a spatula; additionally, in a court proceeding which I recently took part in Caleb Beery, under oath, denied that they ever scalded the infant in their care. 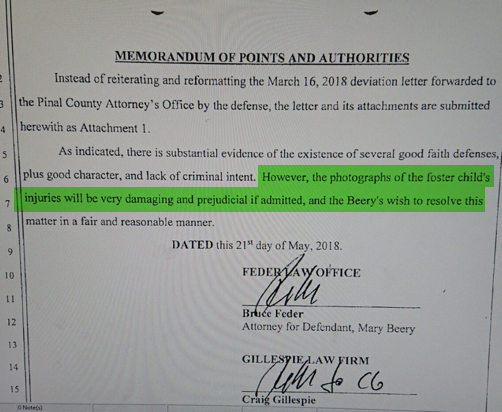 Let it be noted that as foster parents the Beerys signed a document promising not to inflict any type of physical discipline of the foster child in their care. Below is a screenshot from the “Presentence Investigation” of the Beerys. 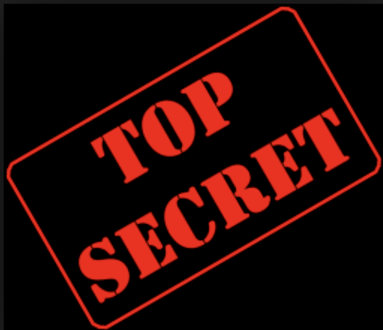 The full document is a part of the court records and may be viewed in its entirety here. The Beerys, undoubtedly on wise counsel from their attorneys, made no such claims to the court about needing to obey God rather than man. 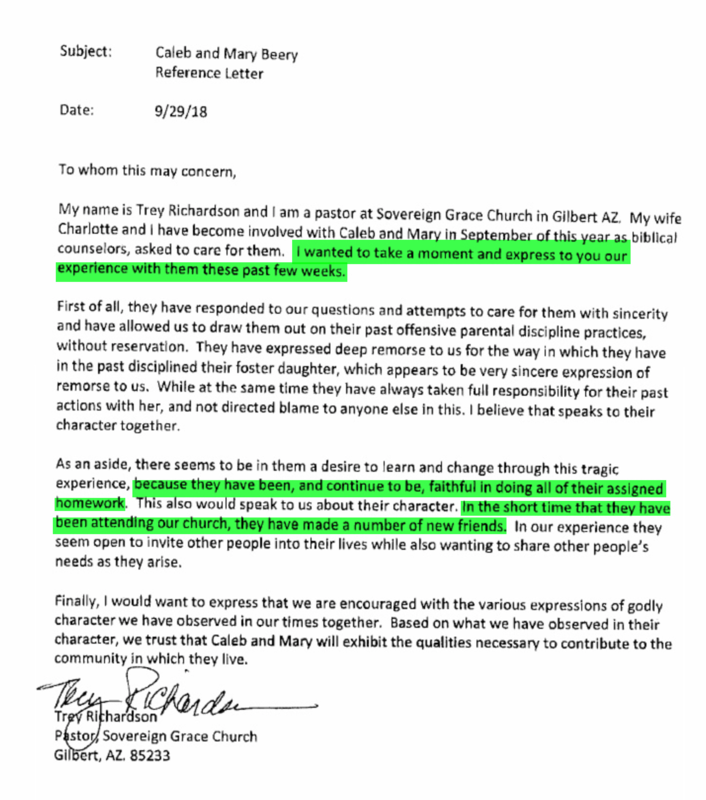 Instead, in this letter to the court from Mary Beery, she readily admitted that breaking their word to not physically discipline the foster child in their care was wrong. The above-mentioned actions and words appear to me contradict the Beerys claim that they only spanked the child with a spatula. Below is a statement from the adoptive father of the foster child who was abused while in the care of the Beerys. This statement may also be found in the “Presentence Investigation” court document. 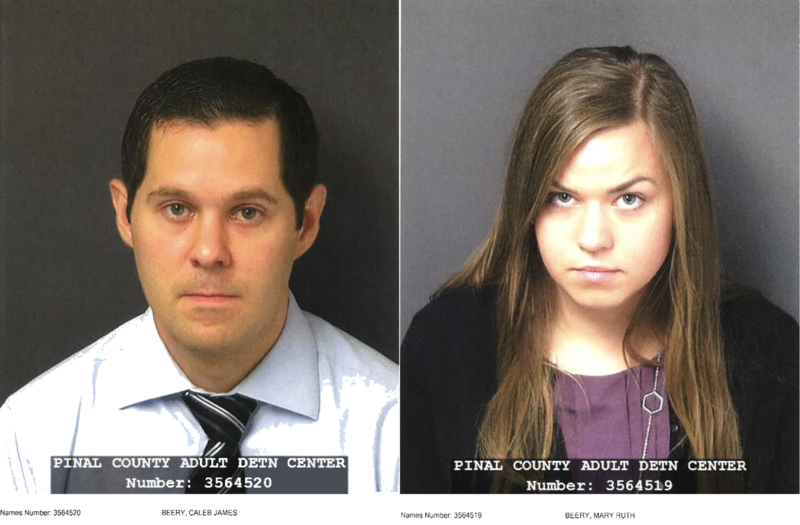 The Beerys and Jeff Ryan have different versions of what happened to the infant child when she was 14 months old and in the care of the Beerys. Who are you going to believe, the Beerys who claim they did not scald the infant in their care, or the adoptive parent who clearly states that the child has burn scars on her buttocks which will be with her for the rest of her life? As a child, I was spanked with a spatula and a wooden spoon, as were my siblings. None of us bear permanent scars. How about you? Do you know of anyone spanked with a spatula who, as a result of the spanking bears permanent scars? I realize there are likely very few people that spank a 14-month-old child with a spatula, but is it reasonable to believe that such a child would scream in pain for two months after the spanking whenever her diaper was changed? Below is a court document submitted by Bruce Feder, Mary Beery’s attorney. 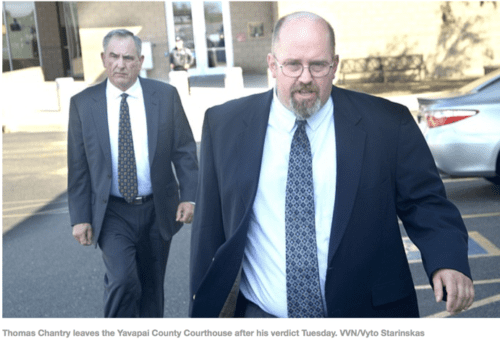 When he saw the photos which the Department of Child Safety had taken of the foster child’s burns he realized how damaging they would be if admitted as evidence in a trial by jury. It appears he then pursued a prudent course of action, which was a plea bargain. Again I must ask the reader if such damaging photographs would result from a spanking with a spatula? Below is a photo of the court documents in the Beery case. 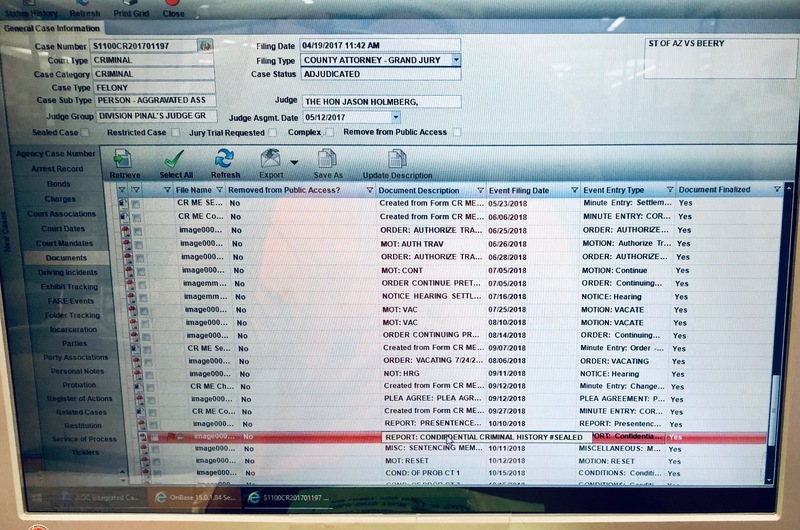 You will notice the line highlighted in red is a sealed, confidential criminal history. It is likely the Department of Child Safety report containing the photos of the injured infant. Understandably the file is sealed. Would the Beery’s narrative hold up if it weren’t? One father tells of his training sessions with each new toddler. He sets aside an evening for “booty” camp, which is a boot camp for toddlers. The child of ten to twelve months is left alone to become deeply interested in a toy or some delightful object. From across the room or just inside the other room, the father calls the child. If he ignores the call, the father goes to him and explains the necessity of immediately coming when called, and then leads him to the father’s chair. The child thus led through these paces is being programmed. He is returned to the toy and left alone long enough to again become engrossed. Another call, and, if no response, the father gives a patient explanation and demonstration of the desired response. The parent, having assured himself of the child’s understanding, once again sets up the situation and calls the child. This time, if there is not an immediate response the child is lightly spanked and lectured. The father continues this throughout the evening until the child readily and immediately responds to a summons. Thereafter, until the child leaves home, he is expected to drop everything and come upon the first call. As long as the parents remain consistent, the child will consistently obey. This “obedience training” is carried out in the utmost patience and concentration. 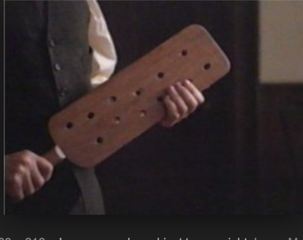 The spanking should not be viewed as punishment, but as reinforcement to commands. We have always had a wood-burning stove for cooking and heating. Toddlers can be seriously burned by a red-hot stove. I have seen some awful scars. But, we had no fear, knowing the effectiveness of training. When the first fires of fall were lit, I would coax the toddler over to see the fascinating flames. Of course, they always wanted to touch, so I held them off until the stove got hot enough to inflict pain without deep burning–testing it with my own hand. When the heat was just right, I would open the door long enough for them to be attracted by the flames. I then move away. The child would inevitably run to the stove and touch it. Just as his hand touched the stove, I would say, “Hot!” It usually took twice, sometimes three times, but they all learned their lesson. Other than the training session, where we never even raised a blister, we never had a child get burned. It was so effective that, thereafter, if I wanted to see them do a back flip, all I had to do was say, “Hot! !” They would turn loose of a glass of iced tea. 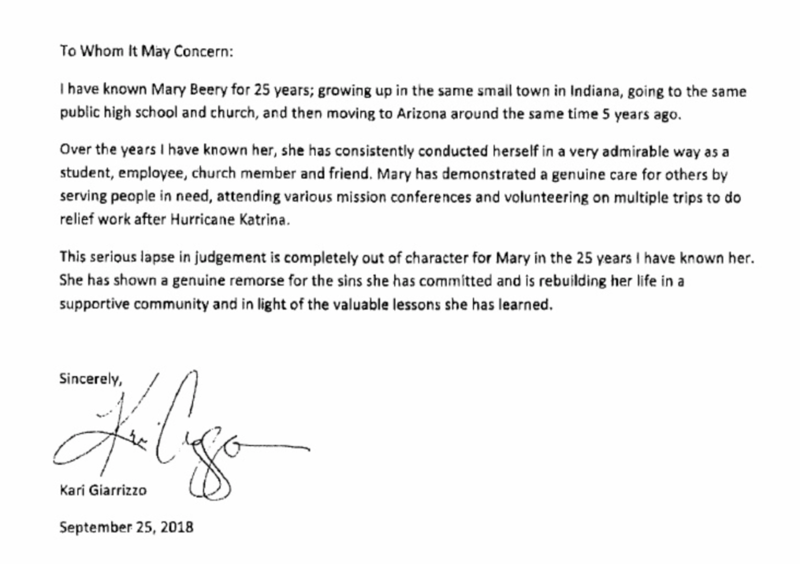 (The letter of support below, as well as all the other letters of support, are contained in an official court document titled “Mary Beery Sentencing Memorandum” and may be viewed here. 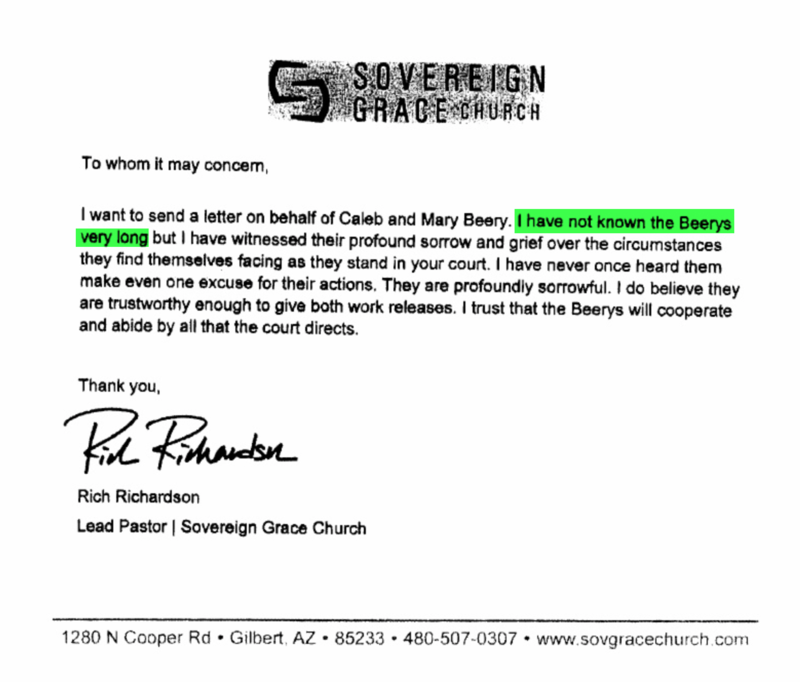 Having now laid the groundwork which I believe should disavow anyone willing to seriously consider the evidence culled from the court documents of the reasonableness of writing a positive character reference letter for the Beerys, I will display a few letters submitted to the court in (slim) hopes that the authors will follow the lead of pastors Trey and Rich Richardson and write the court a second letter stating that upon further reflection they would like to withdraw their letter of support. First up is a letter from John Giarrizzo, senior pastor of Grace Covenant Church. 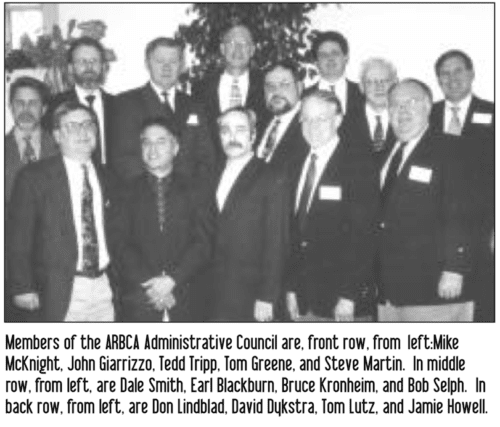 Giarrizzo’s church is a member of ARBCA and he served as the ARBCA Coordinator for several years. 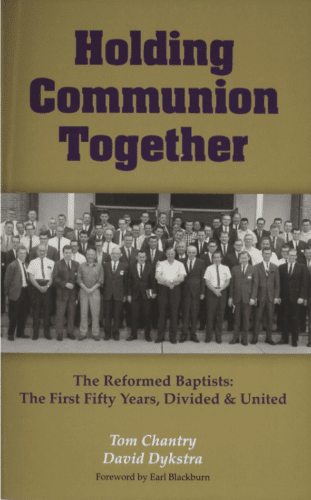 Giarrizzo has recently had all of his elders resign and many members have left the church after the elders published an in-depth investigative report on the role Giarrizzo played in the ARBCA cover-up of the Thomas Chantry child abuse scandal. You can read my article on this here. It is no surprise to me that John Giarrizzo wrote a letter of support for the Beerys. I would be shocked if he followed the lead of Trey and Rich Richardson, but I am a hopeful man. If you read the last sentence of Giarrizzo’s September letter it is obvious to me that he, like many other Evangelicals, are unclear on the difference between the Secular State and the Spiritual Kingdom of Christ. An individual can commit a crime and truly repent and receive forgiveness for his sins from Christ but this does not absolve him from paying the penalty to the secular state for his crimes. Nor does it mean that because he has truly repented in the spiritual realm he should, therefore, be given a lighter sentence by the secular State. The next letter of support for the Beerys was written by Pastor Jon Hueni. Grace Fellowship Church is a member of ARBCA and the church that Mary Beery grew up attending. 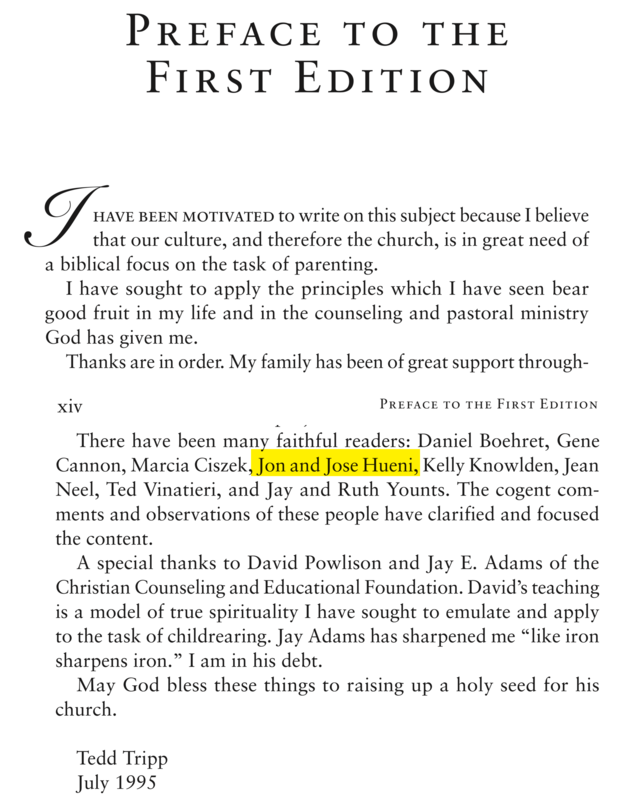 Undoubtedly Mary Beery was familiar with some of Tedd Tripp’s teachings on raising children, Tripp, in his preface to “Shepherding A Child’s Heart” thanks his friends Jon Hueni and his wife Jose (Joann) for their cogent comments and observations. Included in the book is a chapter titled “Embracing Biblical Methods: The Rod” The following quote is from Mary Beery’s letter to the Court and I wonder if Tripp’s book was an influence in their abusive treatment of the infant in their care. 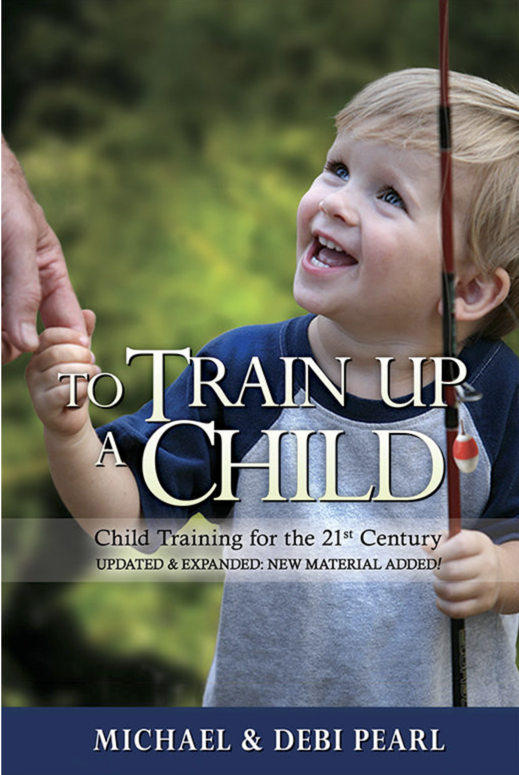 Tedd Tripp teaches 1) employ the rod at the first sign of defiance; 2) apply the rod with the diaper or drawers down so the child feels the sting on their bottom or thigh 3) best to apply the rod with the child over your lap so there is a physical connection between you and the child and 4) hug the child afterwards – if they are not accepting of the hug or their heart is not yet sweet, continue to use the rod until it is! The final letter of support for the Beerys that I will display is written by Kari Giarrizzo. 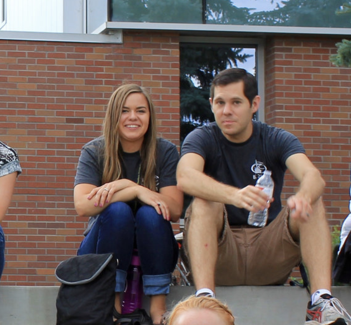 Kari’s maiden name is “Hueni” and yes, she is the daughter of Pastor Jon and Joann Hueni! Kari grew up with Mary Beery and then married Paul Giarrizzo. Paul is the son of Pastor John and Roberta Giarrizzo! If the theme song from Disneyland’s “It’s a Small World” is running through your mind right now, it’s understandable. The ARBCA world is indeed a very small world. With all this interconnectedness it is easy to see how the Beerys would have so many individuals willing to write letters of support for them. The cry of such an abandoned (by biological parents) child will continue for life. THIS is biology. The cry of an abandoned toddler is extensive. Were the Beery’s not taught this? Did Caleb and Mary think to wonder? Jemma was already crying from trauma…Where’s the accountability for such foster displacement? As a result of today’s fostering/adoption practices, our society’s biology suffers. An older fostered or adopted child/ young adult/ senior citizen will still be crying for his/her parents. Brainwashing is traumatic: Being sorry doesn’t fix it. Because, you see, people who have sat in pews all their lives, and have been told that they are worthless (in the eyes of God, which in reality over the years can only actually translate into “you’re worthless in the leader’s eyes”), totally depraved, and the worst one? 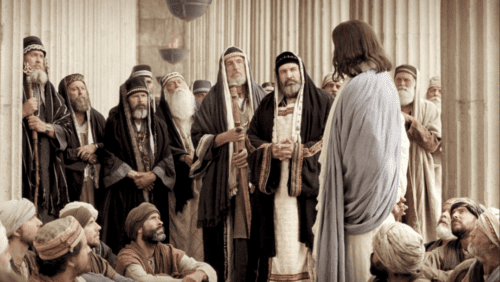 “Your heart is deceitful and wicked, who can know it?”…etc., actually Believe These Words (as in contrast to the ones teaching are Ruling By These Words) because they admire the leaders speaking them. Simple answers to life. Pew dwellers think “If we follow what these people say then we will be like them.” They try to live what they are “taught”and believe everything they are “taught”, including all in the church library. This heavy burden of belief and wasting of time, energy, and tithing moneys, this expensive religious lifestyle must go. Our culture cannot survive it any longer. It means nothing that this couple was respectful in the environment in which they found themselves, of course they were always exemplary when around the crowd. They probably thought they WERE doing right, or at least what they were “taught” while at home abusing a child. Caleb and Mary need to learn to finally find and trust their own intuition, stand on their own two feet. To those who still call that verbiage man-centered/anti-God, etc., find your place in your own life and stay out of other’s business. It is strange that they think that the baby suffered physically and emotionally only from being “taken out of the place she knows as home”. In my opinion that is the best thing that happened in this case. Do they not consider all the abuse they inflicted on her (possibly daily) to have a devastating effect on her for years or possibly the rest of her life? The physical damage might heal but emotional is not so easily healed. The poor child was in survival mode – why would she come to them? Anyone with a shred of empathy or compassion would not treat a crying child or animal in this way. They really need to get out from the bubble they are living in a get some education on how one treat other humans.